Across the planetary systems ruled by the Galactic Empire, few sights are more imposing than the gleaming white armor of an Imperial stormtrooper. As elite soldiers who have received the highest level of combat training, stormtroopers form the backbone of the Imperial Military, and their loyalty to the Emperor and their commanders is unshakable. In the era of the Galactic Civil War, stormtroopers are deployed across the galaxy to keep the peace, stamping out sedition and uprisings before they can take root. Soon, you’ll be able to bring more squads of stormtroopers to your games of Star Wars™: Legion with the Stormtroopers Unit Expansion! 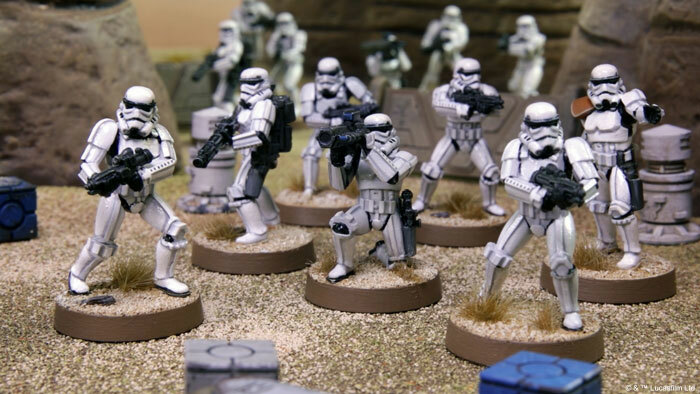 Inside the Stormtroopers Unit Expansion, you’ll find seven unpainted, easily assembled Stormtrooper miniatures, along with the cards and tokens that you need to add this new squad of Stormtroopers to your army. The Stormtroopers Unit Expansion will be released at the same time as the Star Wars: Legion Core Set and seven other expansions—you can pre-order your copies at your local retailer or online through our webstore today! The white-armored stormtrooper is a common sight on occupied worlds throughout the galaxy, so it only follows that it would also be a common sight on the battlefields of Star Wars: Legion. Two units of Stormtroopers are included in the Star Wars: Legion Core Set, but as a corps unit, you can include up to six units of Stormtroopers in your army. Their low cost of 44 points for a single squad also makes them one of your go-to options for filling out your army’s rank and file. As the primary infantry unit of the Galactic Empire, you can expect to see a lot of Stormtroopers on the battlefields of Star Wars: Legion—so you’ll want to know exactly what they’re capable of. 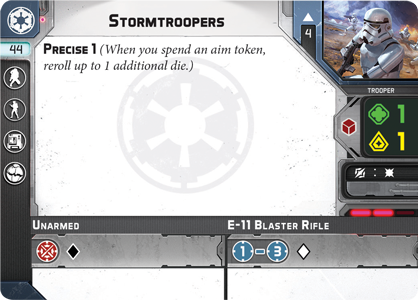 A standard unit of Stormtroopers consists of four Stormtrooper miniatures, but you can add more miniatures with upgrade cards, as we’ll explore below. Stormtrooper weapons are not the most accurate—each Stormtrooper firing an E-11 Blaster Rifle only contributes a single white die (the least accurate attack die). 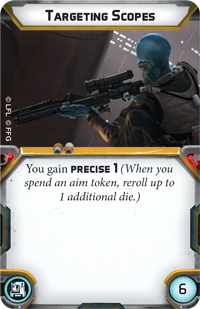 Despite their sub-par weaponry, Stormtroopers have received extensive training, and they also have the Precise 1 ability, which lets them reroll one additional die when using an aim token. What’s more, Stormtrooper armor is relatively sturdy, allowing them to use red defense dice, which offer significantly more protection than white defense dice. Though all Stormtrooper units begin using this same basic template, they have four available upgrade slots for you to customize each unit and make it unique: heavy weapon, personnel, grenades, and gear. 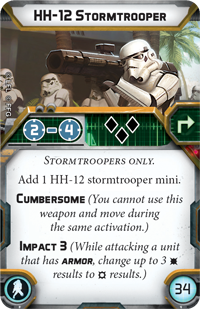 Just like the Stormtroopers units included in the Core Set, the Stormtroopers Unit Expansion offers the same upgrades for your personnel and heavy weapon slots. By taking the Stormtrooper upgrade, you add another standard Stormtrooper miniature to the squad—giving your squad more firepower and making it harder for your opponent to completely destroy it. Alternatively, you may decide to bring in some specialists with armaments that make them much more dangerous than a standard Stormtrooper. 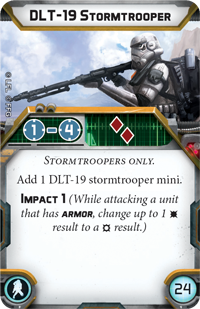 Stormtrooper units have a single heavy weapon upgrade slot, and the same two heavy weapon miniatures are offered in the Stormtroopers Unit Expansion and the Core Set—the DLT-19 Stormtrooper and the HH-12 Stormtrooper. Heavy weapons troopers commonly display an additional weapon profile on their upgrade card. 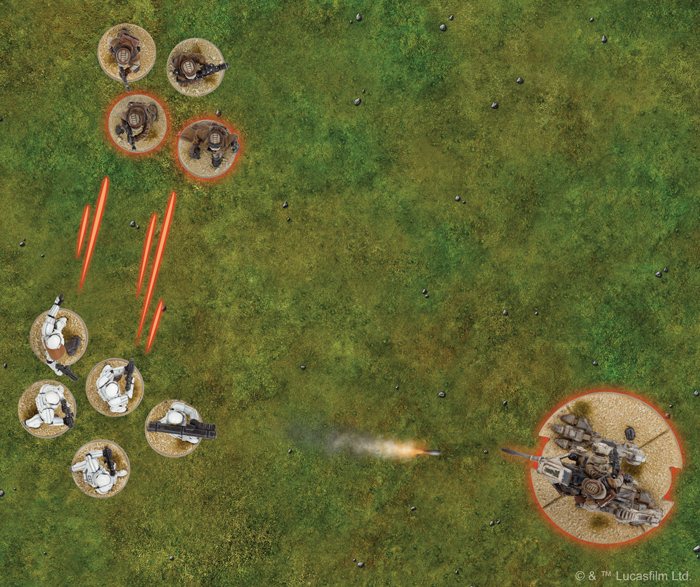 When you’re attacking with this unit, you can choose to have the heavy weapon miniature attack with the weapon shown on its upgrade card—though it may also use the weapons on its unit card if you prefer. If you bring a Stormtrooper wielding the DLT-19 heavy blaster rifle into your unit, you gain a much greater ability to fire accurately from long distance. The DLT-19 Stormtrooper can attack up to Range 4, using two red dice—a long-range attack that has a very good chance of hitting, if you’d like to pick off enemy units as they attack. Alternatively, you can tweak your Stormtrooper squad to concentrate fire on vehicles if you use the HH-12 Stormtrooper. This heavy weapon miniature’s HH-12 rocket launcher stands a good chance of punching through enemy armor with the Impact 3 keyword… but this weapon is cumbersome and time-consuming to reload. 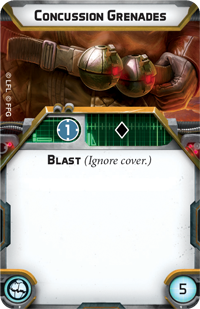 You can’t fire with the HH-12 Stormtrooper and move in the same activation, and when you do fire, this card’s exhaust icon means that you must exhaust the card—preventing you from firing with it again until you take a recover action. The Stormtroopers concentrate fire on a Rebel Trooper squad, while the HH-12 Stormtrooper fires a rocket at the Rebel AT-RT! 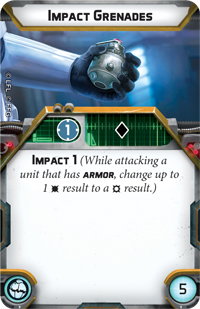 The final upgrades in the Stormtrooper Unit Expansion—for grenades and gear—mark a departure from the upgrade cards included in the Core Set. Within the Core Set, you have access to Concussion Grenades and Targeting Scopes. This Unit Expansion, however, offers different options. Impact Grenades give your Stormtroopers a close-range attack, sacrificing the blasting qualities of Concussion Grenades in order to gain the Impact keyword to pierce the armor of vehicles. 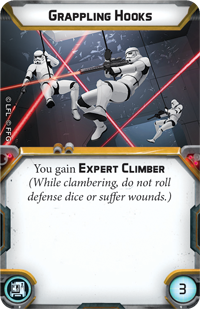 Alternatively, you may equip your Stormtroopers with Grappling Hooks instead of Targeting Scopes, making them expert climbers who can scramble across terrain with ease. Ultimately, no matter how you choose to equip your Stormtroopers, these squads fill out your Imperial armies, supporting mighty units like Darth Vader or an AT-ST as they stomp into battle. Muster your units of Stormtroopers and prepare to march into battle! The power of the Galactic Empire will spread across the galaxy and the Imperial banner will fly above every planet. 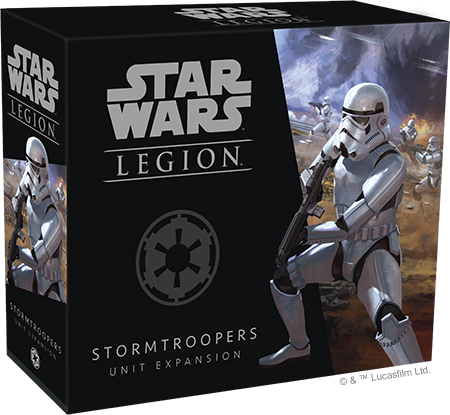 Look for the Stormtroopers Unit Expansion to release alongside the Star Wars: Legion Core Set and seven other expansions! 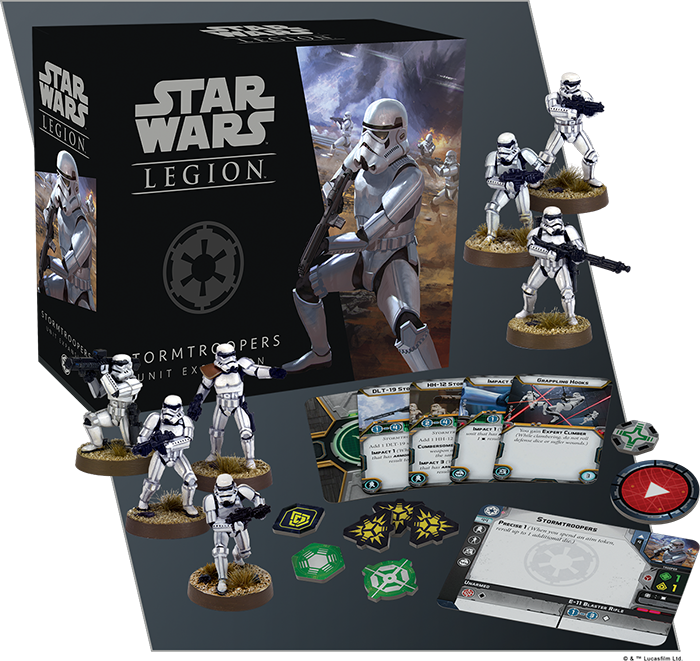 You can pre-order the Stormtroopers Unit Expansion (SWL07), the Star Wars: Legion Core Set (SWL01), and other Unit Expansions at your local retailer or online through our webstore today.